120347 Salacia, provisional designation 2004 SB60, is a trans-Neptunian object in the Kuiper belt, approximately 850 kilometers in diameter As of 2018, it is located about 44.8 Astronomical Units from the Sun, and reaches apparent magnitude 20.7 at opposition. Salacia and its moon Actaea, imaged by the Hubble Space Telescope on 21 July 2006. Salacia was discovered on 22 September 2004, by American astronomers Henry Roe, Michael Brown and Kristina Barkume at the Palomar Observatory in California, United States. It has been observed 124 times, with precovery images back to 25 July 1982. Salacia orbits the Sun at an average distance that is slightly greater than that of Pluto. It was named after the Roman goddess Salacia and has a single known moon, Actaea. Brown estimated that Salacia is very likely a dwarf planet. However, Grundy et al. argue that objects such as Salacia, in the size range of 400–1000 km, with albedos less than ≈0.2 and densities of ≈1.2 g/cm3 or less, have likely never compressed into fully solid bodies, let alone differentiated, and so are highly unlikely to be dwarf planets. The orbit of Salacia is similar to Pluto, except for a near opposite longitude of ascending node. Its current position is near its most northern position above the ecliptic. Salacia is a non-resonant object with a moderate eccentricity (0.110) and large inclination (23.9°), making it a scattered–extended object in the classification of the Deep Ecliptic Survey and a hot classical in the classification system of Gladman et al., which may be a non-distinction if they are part of a single population that formed during the outward migration of Neptune. Salacia's orbit is within the parameter space of the Haumea collisional family, but Salacia is not part of it, because it lacks the strong water-ice absorption bands typical of its members. The total mass of the Salacia–Actaea system is 7020438000000000000♠(4.38±0.16)×1020 kg, of which some 96% should be in Salacia itself, from the relative diameters. Salacia is large enough that it is unlikely to have a significant porosity and is likely differentiated. A rocky core (with a density 2.77–3.66 g/cm3) can be 0.4–0.65 of the total diameter of Salacia if its water-ice mantle is non-porous, and 0.45–0.7 of its total diameter if its mantle has 10% porosity. 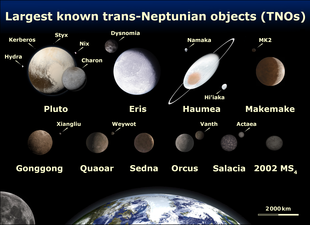 Salacia has the lowest albedo and density known of any known big trans-Neptunian object. Salacia's infrared spectrum is almost featureless, indicating an abundance of water ice of less than 5% on the surface. Its light-curve amplitude is only 3%. Mike Brown's website lists Salacia as nearly certainly a dwarf planet, but the IAU has not formally recognized it as such. Salacia has one natural satellite, Actaea, that orbits its primary every 7005474664320000000♠5.49380±0.00016 d at a distance of 7006561900000000000♠5619±89 km and with an eccentricity of 6997840000000000000♠0.0084±0.0076. It was discovered on 21 July 2006 by Keith S. Noll, Harold Levison, Denise Stephens and Will Grundy with the Hubble Space Telescope. Actaea is 7000237200000000000♠2.372±0.060 magnitudes fainter than Salacia, implying a diameter ratio of 2.98 for equal albedos. Hence, assuming equal albedos, it has a diameter of 7005286000000000000♠286±24 km Actaea has the same color as Salacia (V−I = 6999890000000000000♠0.89±0.02 and 6999870000000000000♠0.87±0.01, respectively), supporting the assumption of equal albedos. It has been calculated that the Salacia system should have undergone enough tidal evolution to circularize their orbits, which is consistent with the low measured eccentricity, but that the primary need not have been tidally locked. The ratio of its semi-major axis to its primary's Hill radius is 0.0023, the tightest trans-Neptunian binary with a known orbit. Salacia and Actaea will next occult each other in 2067. This minor planet was named after Salacia (/sæˈleɪʃə/), the goddess of salt water and the wife of Neptune. Naming citation was published on 18 February 2011 (M.P.C. 73984). The moon's name, Actaea /ækˈtiːə/, was assigned on the same date. Actaea is a nereid or sea nymph. ^ a b c d e "JPL Small-Body Database Browser: 120347 Salacia (2004 SB60)" (2017-09-21 last obs.). Jet Propulsion Laboratory. Retrieved 22 July 2018. ^ a b c d "120347 Salacia (2004 SB60)". Minor Planet Center. Retrieved 22 July 2018. ^ "MPEC 2009-R09 :Distant Minor Planets (2009 SEPT. 16.0 TT)". IAU Minor Planet Center. 2009-09-04. Retrieved 2011-07-05. ^ Buie, Marc W. "Orbit Fit and Astrometric record for 120347" (2007-08-12 using 62 of 73 observations). SwRI (Space Science Department). Retrieved 2009-10-04. ^ a b c d e f g h i j k l m n Stansberry, J.A. ; Grundy, W.M. ; Mueller, M.; et al. (2012). "Physical Properties of Trans-Neptunian Binaries (120347) Salacia–Actaea and (42355) Typhon–Echidna". Icarus. 219: 676–688. Bibcode:2012Icar..219..676S. CiteSeerX 10.1.1.398.6675. doi:10.1016/j.icarus.2012.03.029. ^ a b Brown, Michael E. "How many dwarf planets are there in the outer solar system? (updates daily)". California Institute of Technology. Retrieved 2016-11-29. ^ Gladman, B.; Marsden, B. G.; VanLaerhoven, C. (2008). "Nomenclature in the Outer Solar System". The Solar System Beyond Neptune (PDF). p. 43. ^ Schaller, E. L.; Brown, M. E. (2008). "Detection of Additional Members of the 2003 EL61 Collisional Family via Near-Infrared Spectroscopy". Astrophysical Journal. arXiv:0808.0185. Bibcode:2008ApJ...684L.107S. doi:10.1086/592232. ^ "List of Dwarf Planets". NASA. Archived from the original on 2012-05-04. Retrieved 2012-06-09. ^ "IAUC 8751: (120347) 2004 SB_60; 2006gi, 2006gj; V733 Cep". Cbat.eps.harvard.edu. Retrieved 2014-06-14.